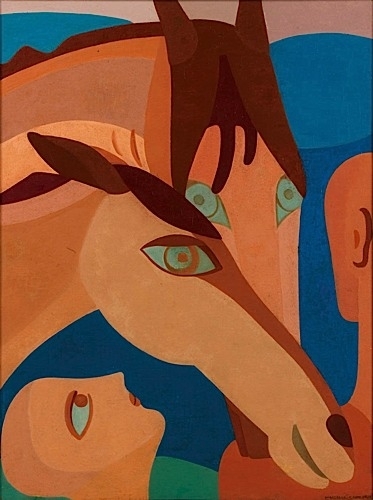 Today's inspiration is entitled Personnages aux chevaux or Characters with Horses, is by Marcelle Cahn. She was a French artist born into a Jewish family in Strasbourg. You can read more about Mercelle Cahn in this article. It depicts two people looking at a pair of horses. With this piece, I can see blue, green/teal, leather, suede, fringe, braiding, earthy colors. The shape of the eye, or even polka dots. From time to time I see eyes in pieces jewelry, as well, i.e., hamsa, evil eye, etc. What elements did you, or would you, select? This week's painting was curated by me. In addition to me, this challenge is also hosted every two weeks by Daenel at Living Outside the Stacks and Salazar at 14 Shades of Grey. I selected this painting because I like the vivid coloring, the equestrian theme, and the exaggerated eyes. I have several things in these colors, so I began by pulling most of them out of the closet. The only piece I knew I wanted to start with was the lace top (thrifted). I was in the mood for a skirt so grabbed my cabi teal one, it seemed the outfit needed a belt, which I thought was an appropriate addition. I was already wearing the socks from the morning(!). The Sam Edelman boots and Free People jacket both say "rugged cowboy" to me, so those were used to include the horse theme. If you look at my necklace in the more close up photo, you will see that the loop holding the chain is two stirrups and the dangle is a stylized horse head. This is one of those outfits that probably wouldn't have come together if it hadn't been for this week's artwork and I couldn't be more happy with it! There's still time to submit your outfit for Style Imitating Art! Please email your outfit selection to me at fiercefashionblog@gmail.com by tomorrow, Tuesday, March 26, to be included in our roundup published here on Wednesday, March 27. You don't have to be a blogger, or an Instagrammer to join us, you just have to like clothes! If the art isn't quite enough culture for you, here's some music! I couldn't help but think of this song. You know, because I'm in the briers and the brambles?! From 1959. Why I can recall this, I don't know. My Dad? Fun fact: The Battle of New Orleans spent six weeks as a #1 hit.